“Do not open the door from which comes smoke out. Do not loose the calm, don’t scream, don’t run, it can cause collective hysteria and hinder the people evacuation”. We stopped at Aranda del Douro to pick up some wine, we bought 5 litre boxes of rosé at under €8 a box. We stopped for lunch at a roadside restaurant, €10 for three courses, including bread, water and wine. The food was home cooked, rustic but very tasty (we had venison casserole). 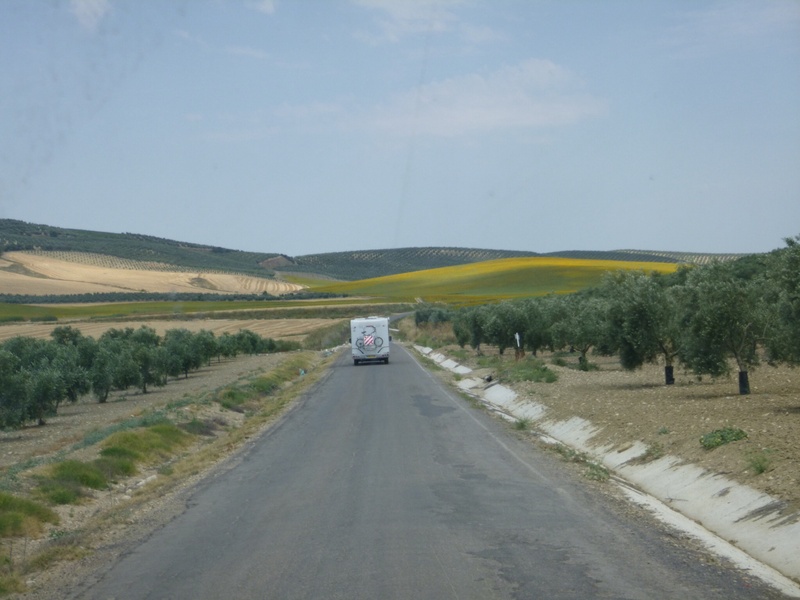 We stayed the night at a campsite in Haro (in the Rioja region) and bought boxes of young red wine, 15 litres for €25. 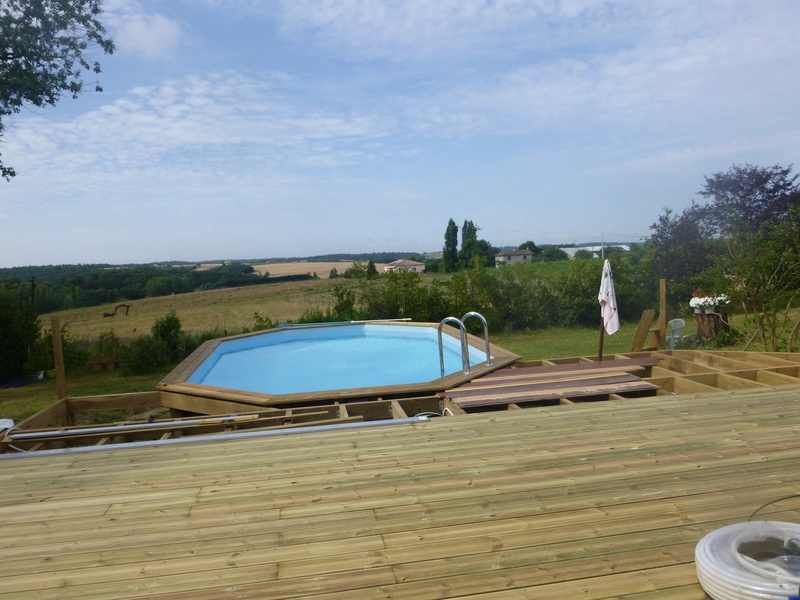 By afternoon the sun was out again and it was a warm 28° encouraging us to have a swim in the pool. 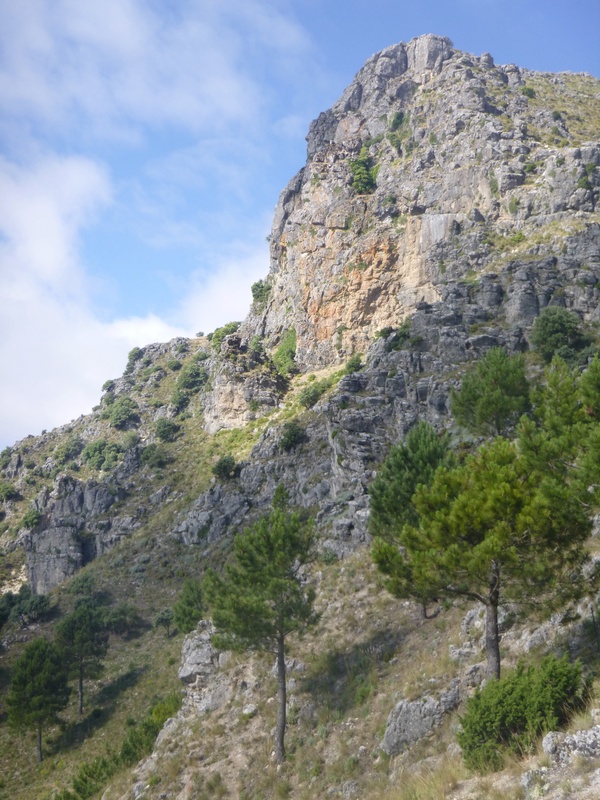 Our campsite was about three miles from Ronda. We travelled into the city by car and found several underground car parks within walking distance of the city centre. 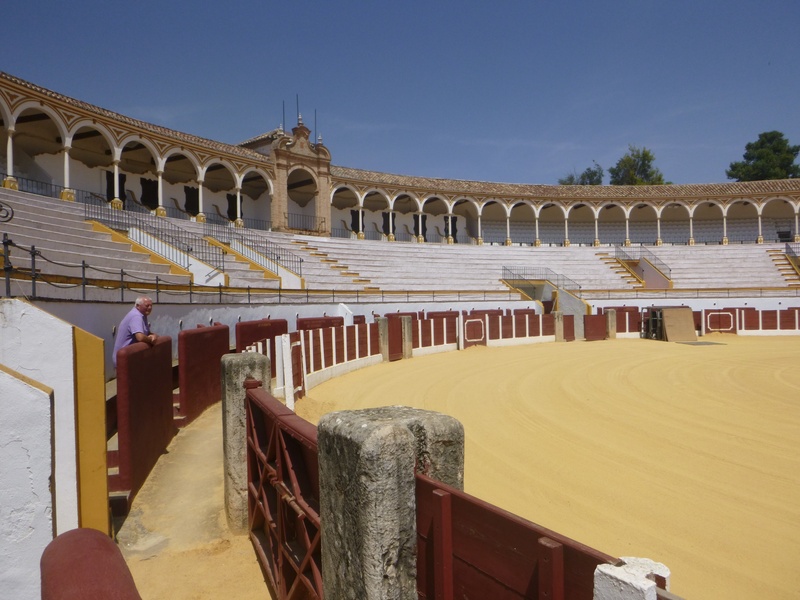 We visited the famous bullring and learned that only one bullfighter had been killed there since it was built in 1785 – although many thousand bulls were not so fortunate. 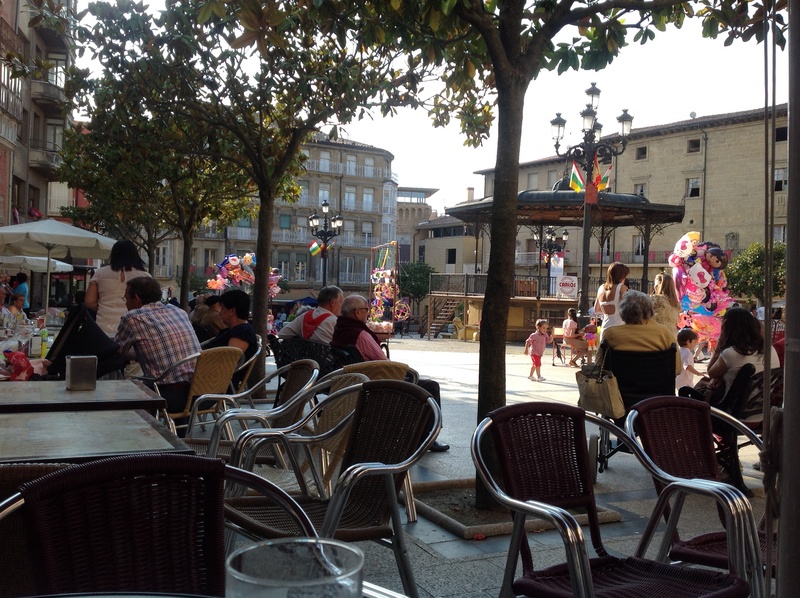 The city was beautifully clean with many restaurants and cafés. It overlooked a deep, rocky chasm and its narrow streets lead down to the bottom of the chasm where there were some Roman baths. 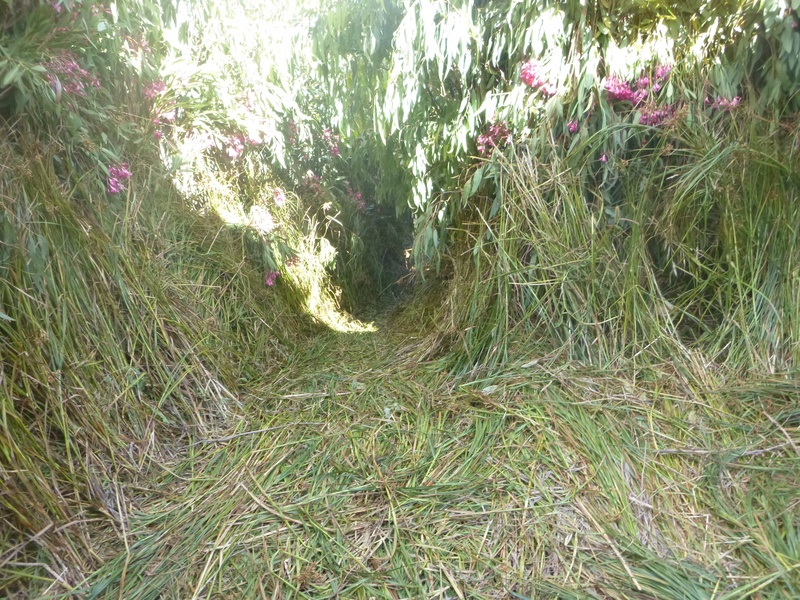 The chasm was spanned by several bridges. The New Bridge was constructed in 1850, the other bridges were several hundred years older. 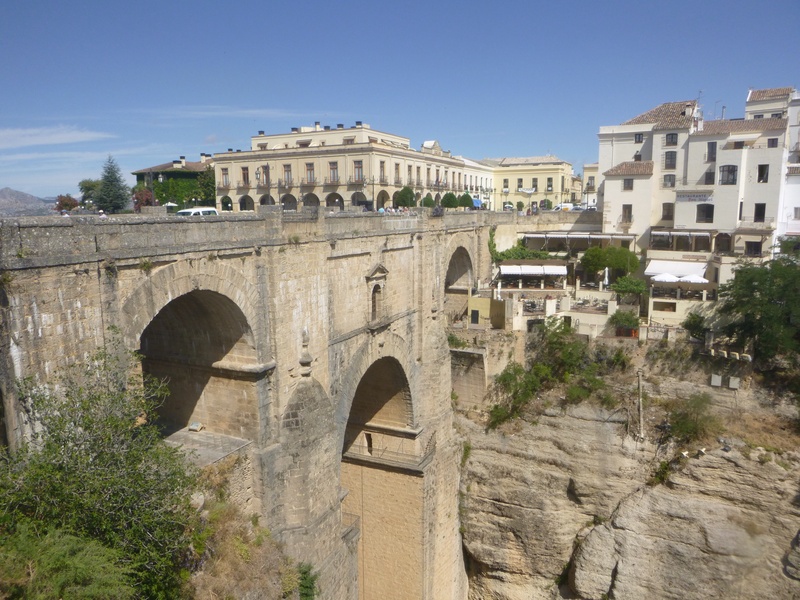 We arrived in Ronda the following evening, the campsite was next to a hotel so we spent an enjoyable evening eating tapas, drinking wine and watching England being thrashed by Uruguay in the World Cup. The owner of the hotel seemed very sympathetic and brought us a complimentary liqueur when the match was over. The bar was pretty full, including three Guardia Civil. 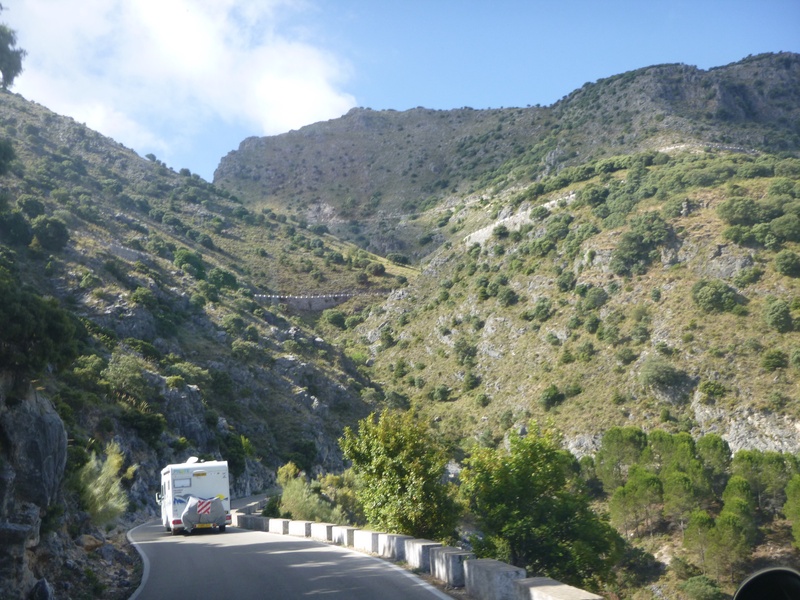 During the next two days we did a circular drive into the Sierra Ubrique, stopping at a campsite at Benamahoma in Grazalema National Park. We visited the Pileta Cave, a series of underground caverns and lakes discovered in the early 1900s by a local farmer and found to have been inhabited thousands of years ago. 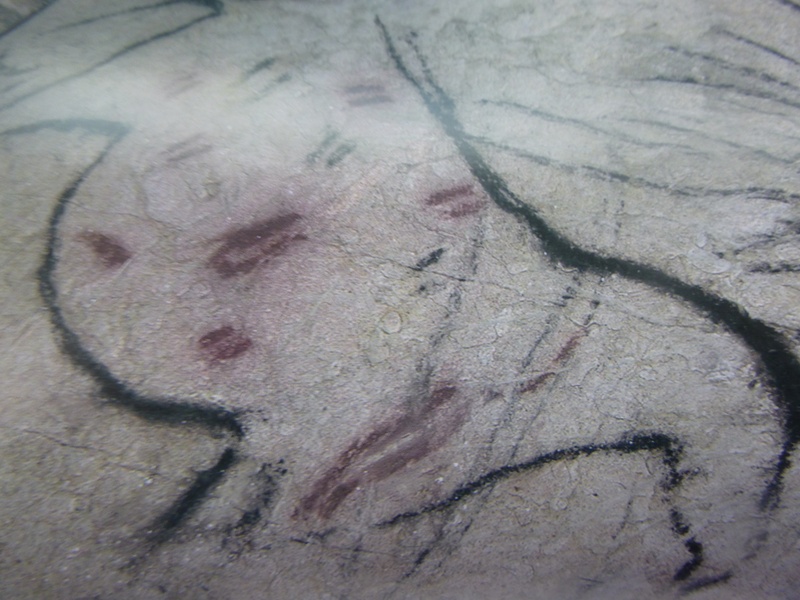 There were prehistoric paintings on the walls, some judged to be 22,000 years old. 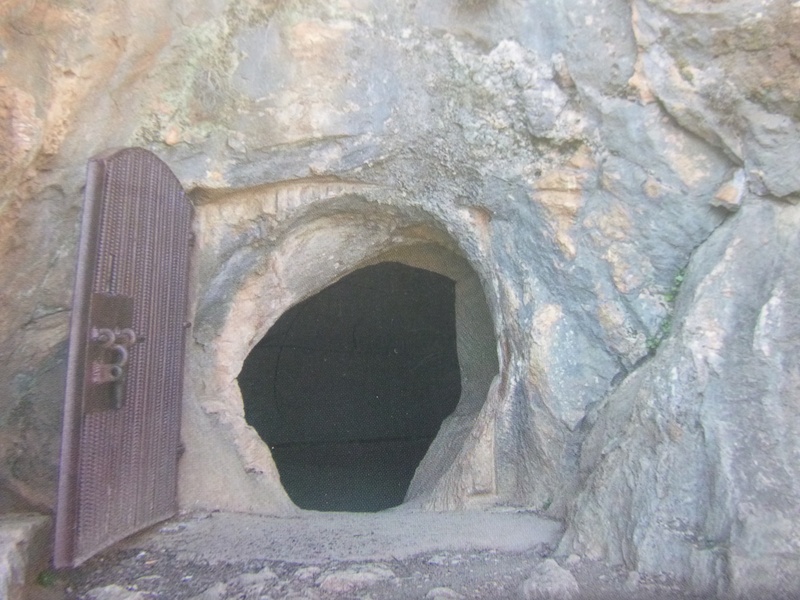 The caves had not been “modernised”; we were given electric lamps and followed a damp path using the steps cut in the rock by the farmer and holding onto clammy, rusty handrails. Bats lived overhead. 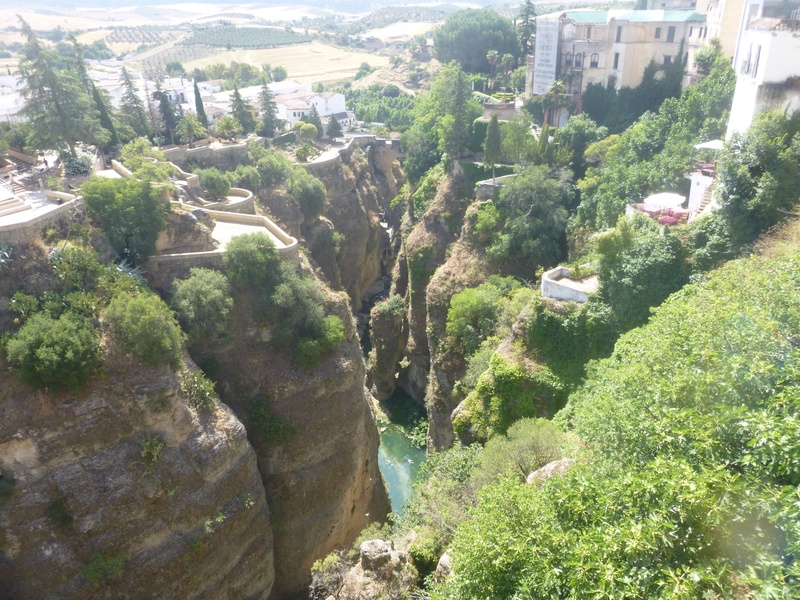 We walked slowly through narrow passages from cavern to cavern, admiring the lofty roofs, the clear lake water, the huge stalactites that grow from the roof – 1cm every hundred years. At the end of the tour we had to turn round and retrace our steps back to the narrow entrance. We had been underground almost two hours, it was good to be out in the sunshine again. We ate in a restaurant that evening, their speciality was local trout from the nearby trout farm, fed by mountains streams. 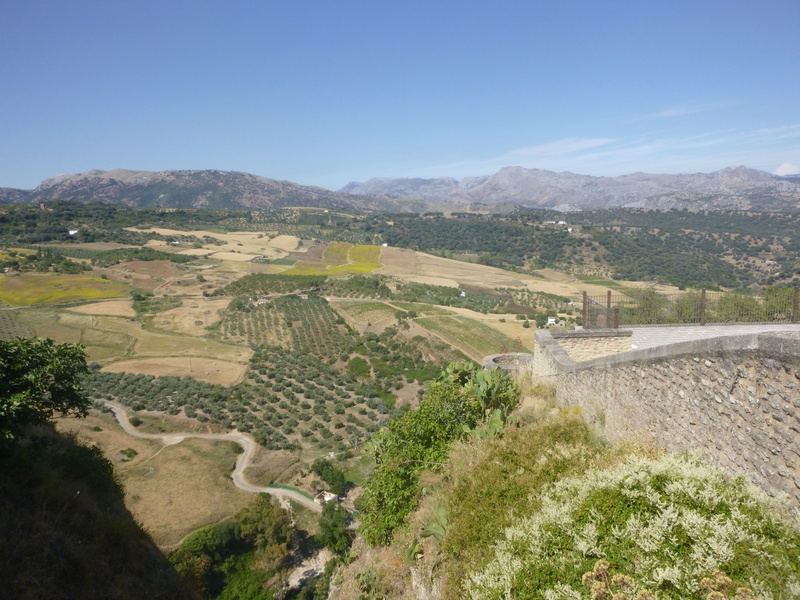 We visited the town of Grazalema which was the centre for leather work and blanket weaving. It was Saturday afternoon and all the cafés were open but the shops were closed. 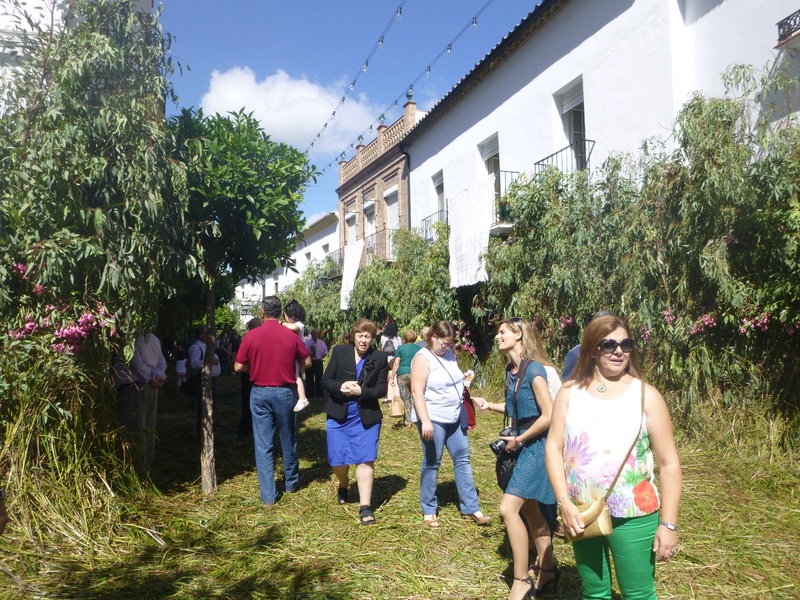 The following morning -Sunday – we visited Zahara when they were celebrating the feast of Corpus Christi. 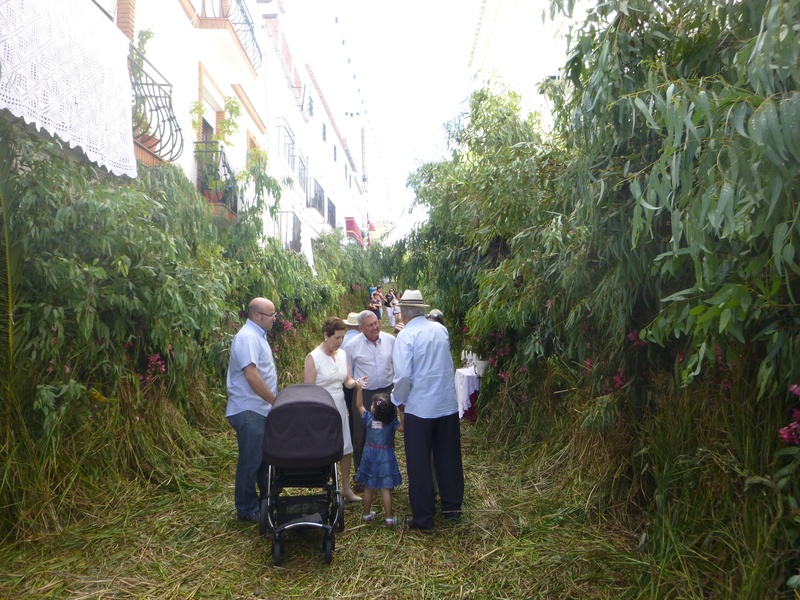 The narrow streets and squares were lined with foliage and flowers, with thick layers of fresh reeds on the ground, creating a fragrant green carpet. The streets were crowded with folk in their Sunday best, mingling with the tourists. 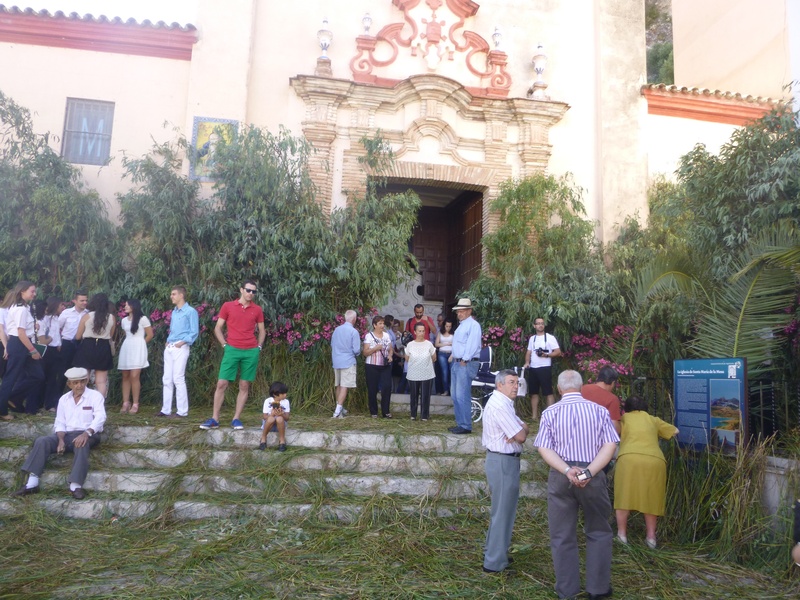 There was a service in progress in the church, the interior was hot and humid and packed with worshippers who appeared oblivious to tourists crowding in on them and taking flashy photos of their beautiful altar and chancel. 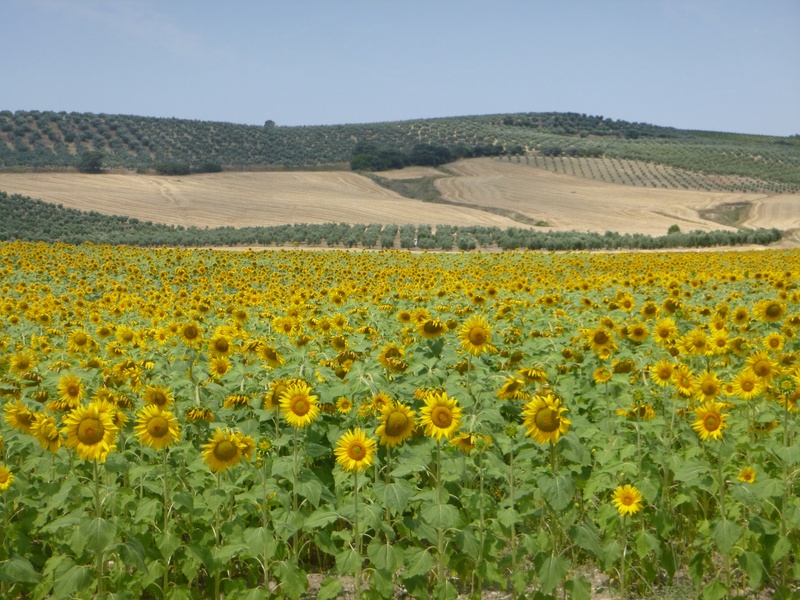 The drive to our next campsite at Santaella, 30k from Córdoba, took us through olive groves and more olives groves – we were quite excited when field of sunflowers appeared on the hills ahead. 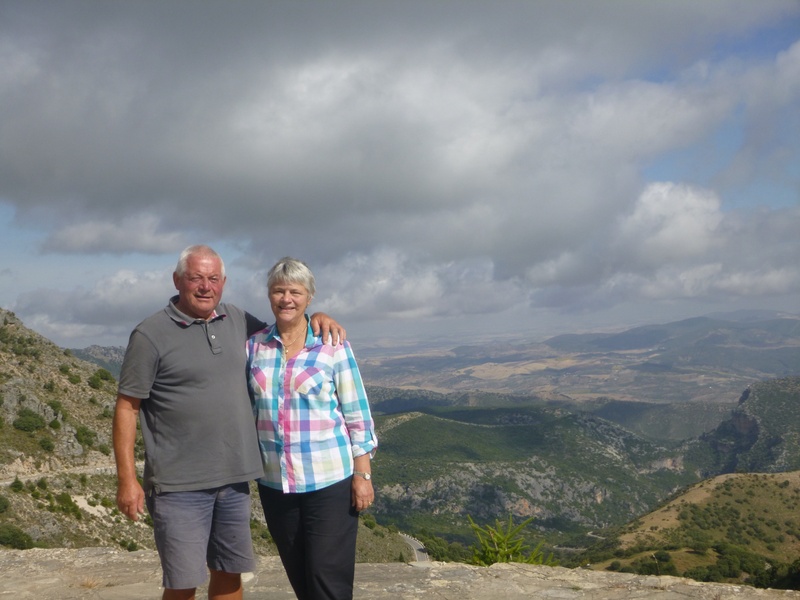 The site was owned by Rik and Mathilde whom we had first met travelling in Morocco. We had been to their site earlier in the year, then it had been chilly and we had enjoyed a meal sitting by their log burning stove. Now we were more interested in their swimming pool. 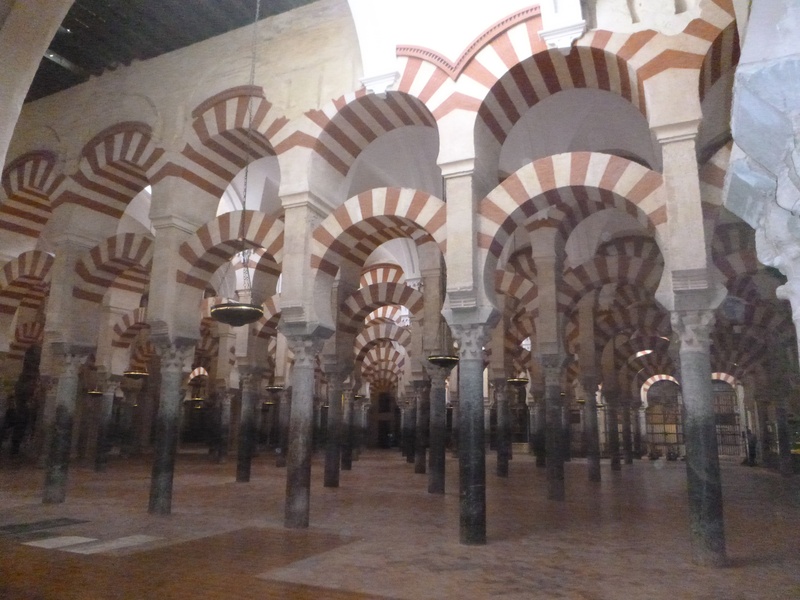 We took the bus into Córdoba and visited the Mesquita of Córdoba, a 8th century mosque. It was a magnificent building, originally constructed on the site of a temple to the Roman god, Janus. 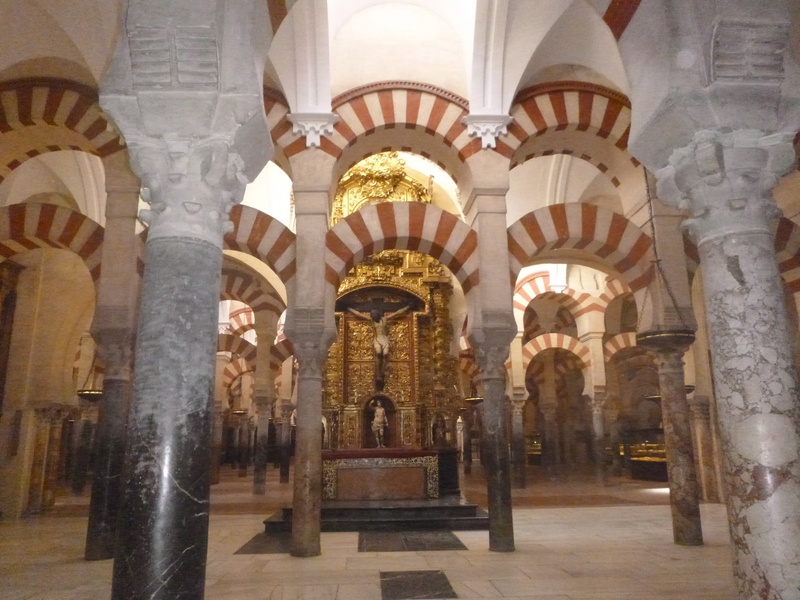 The Mosque had been built by the Muslims but, with the Christian reconquest of Spain in the 13th century, it had been consecrated as a Catholic cathedral and was still being used today. The weather was getting extremely hot. 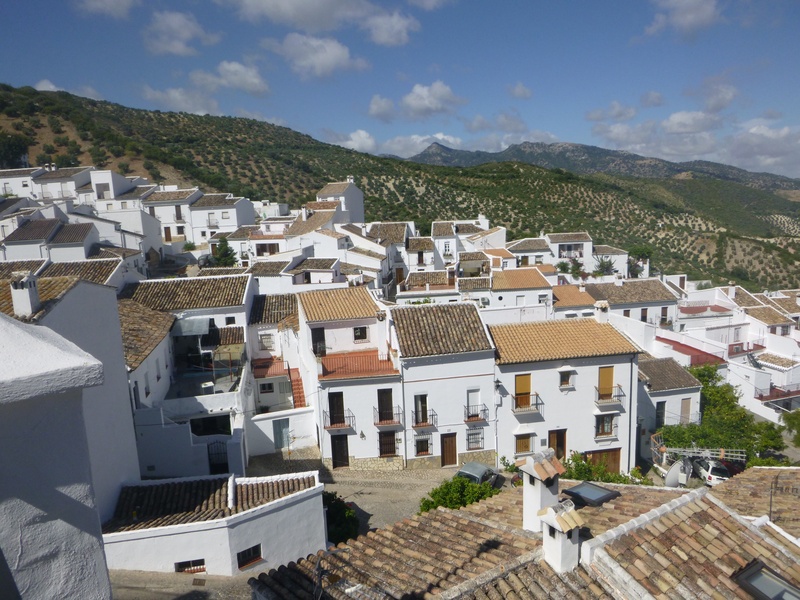 When we were high up in the mountains we had the benefit of a cooling breeze but the following day we drove to Iznajar, a pueblo blanco (white village) built around the ruins of an 8th century Moorish castle at the top of a rocky outcrop. There was a lake 32k long and 6k wide that surrounded the village on both sides, so it resembled an island in the middle of the lake. We got a lift to the top of the village. 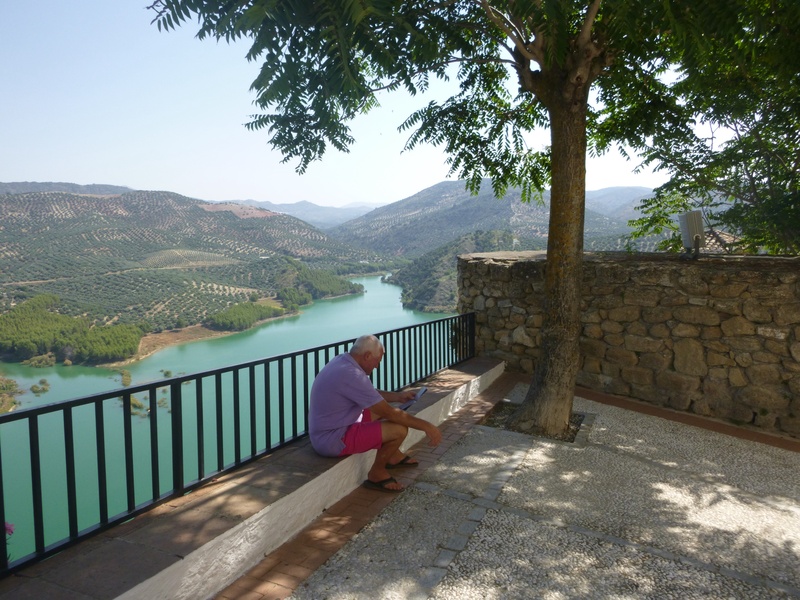 The temperature was already over 30° so we dived into the nearest café for a cooling drink and to take in the magnificent panorama of the lake with a backdrop of hills covered in silvery olive trees. 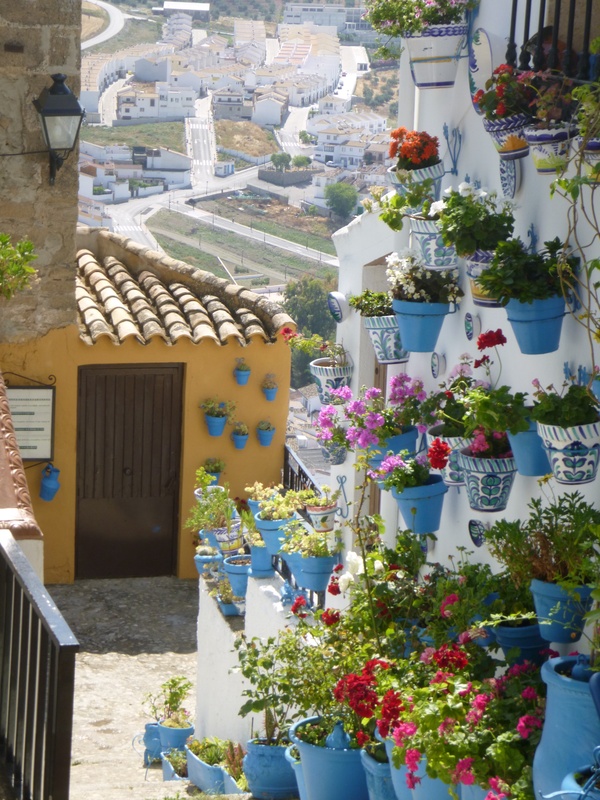 We walked down the hill following the labyrinth of narrow lanes lined with typical Andalusian whitewashed houses. By that time we reached the bottom the temperature was over 40°, so we returned to the campsite, collected our bathers and a couple of chairs and spent the remainder of the day at the lakeside, sitting under the pine trees and swimming in the lake. The temperature stayed high until well after sunset. We had a meal in the local hotel and walked back afterwards in the relative cool of the evening, only having to stop once to have a nightcap in a lakeside café. 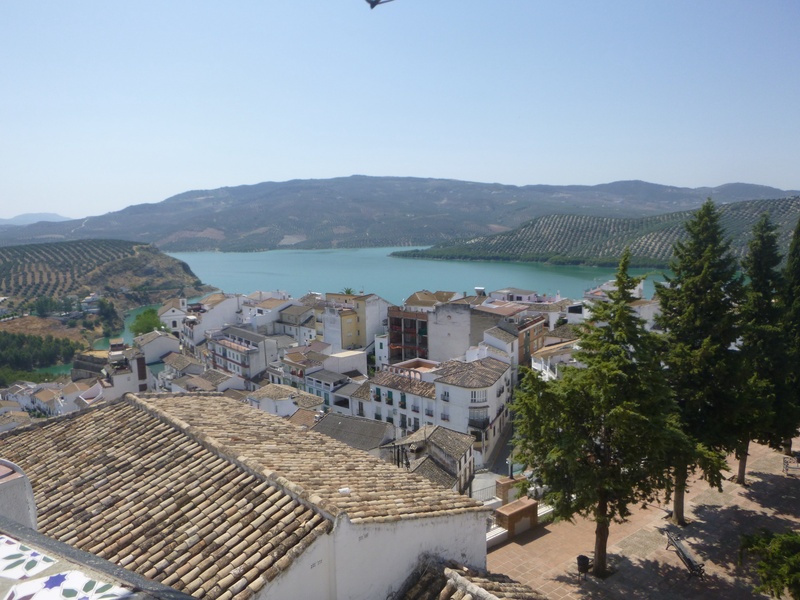 After stopping for a sumptuous breakfast at La Magdalena, a convent converted into a hotel and golf resort, we on drove into Antequera – a ancient town at the crossroads between Málaga, Granada, Córdoba and Seville. 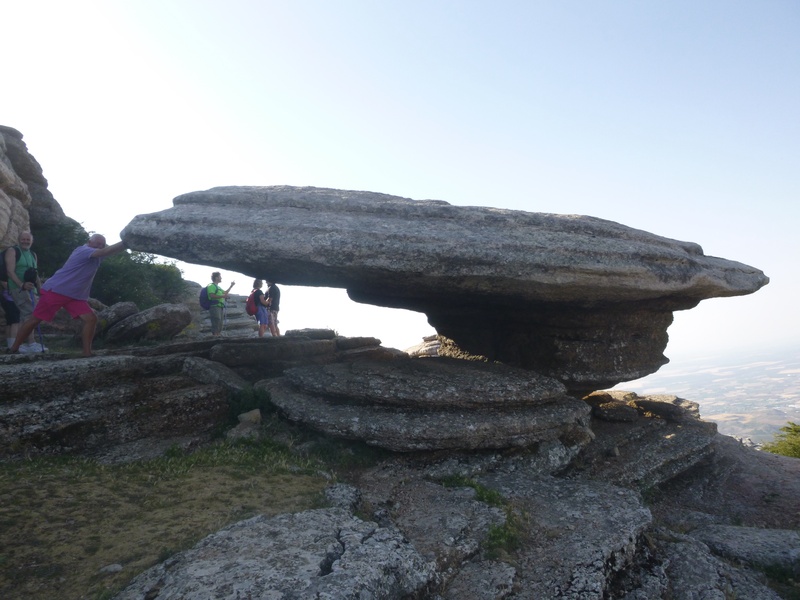 We visited the Dolmen de Menga, ancient burial chambers made of huge stones and then covered in earth. The mounds were rediscovered and excavated in the 19th century. 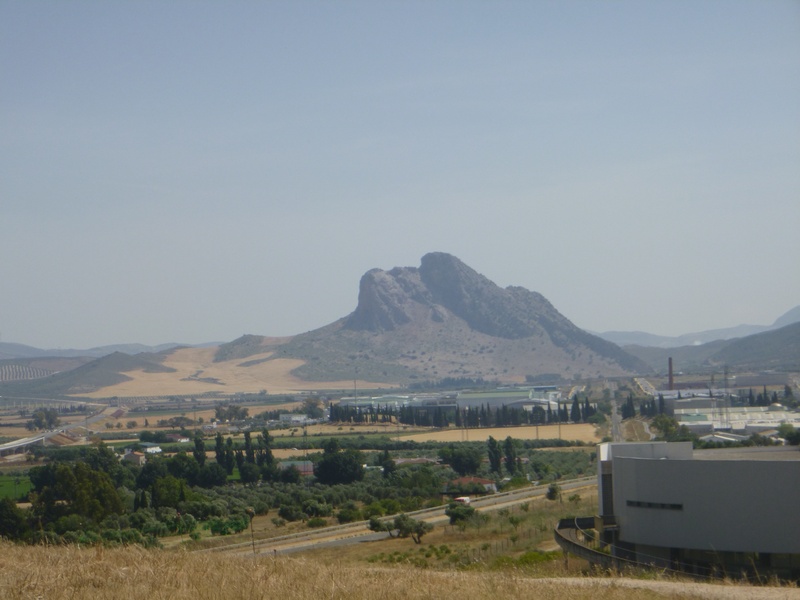 As you stand at the door of the Dolmen you could see a huge rock formation that resembled a sleeping giant. 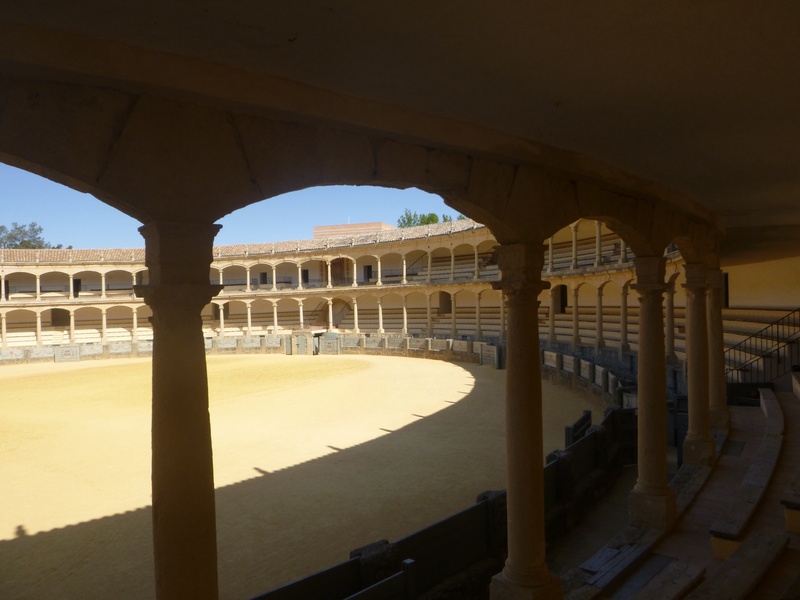 We also visited the bull ring and museum and had a tour of the city in an electric buggy. 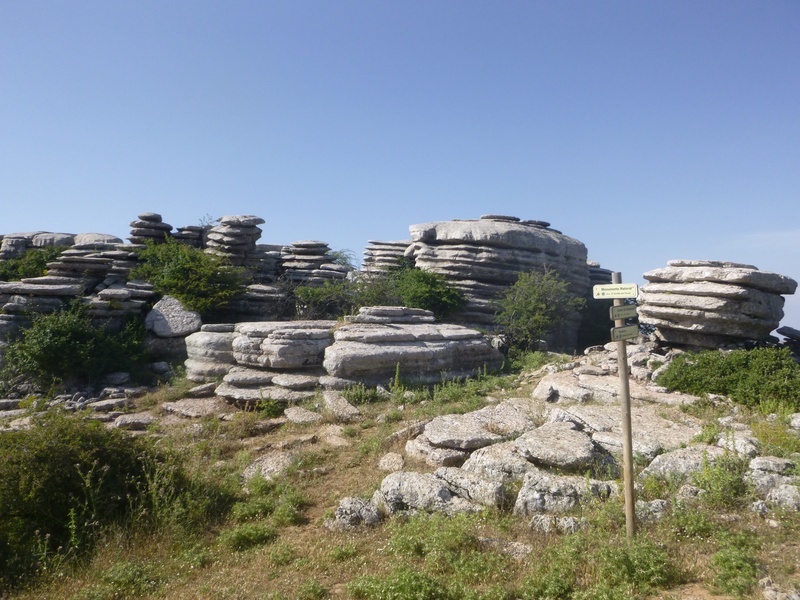 We drove a short distance on to El Torcal Nature Reserve where we camped overnight and met Billy, a little fox, who lived near the car park and would take morsels of food from your hand. She looked in good condition and well fed. 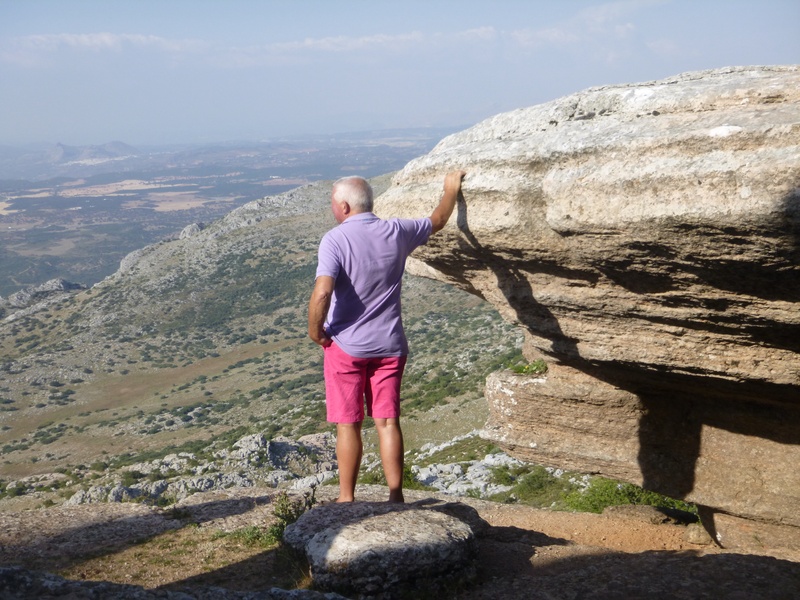 We had a guide who took us on a two hour walk that evening, more of a climb really – we reached 4000 feet and the view was stunning. On a clear day you could see Africa. 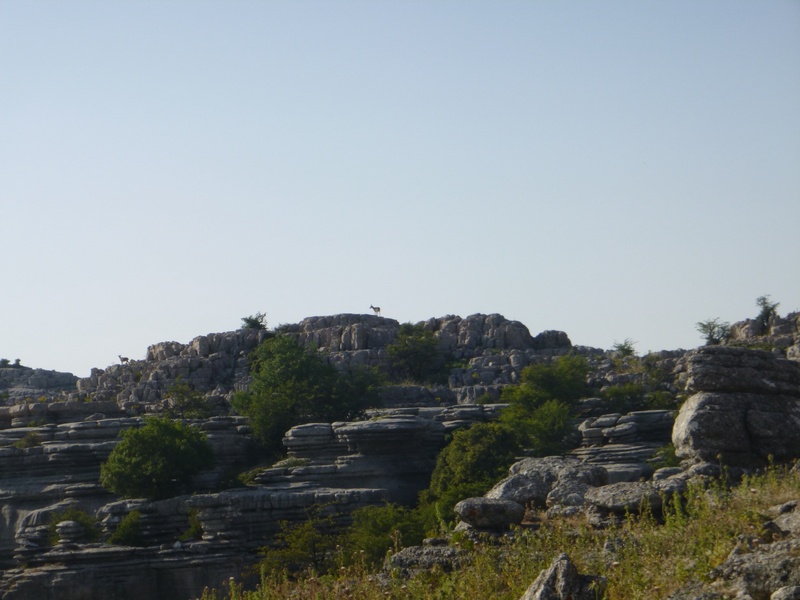 At one point we saw we were being watched by a couple of ibex, silhouetted on rocks high above us. There was an observatory at the Centre and when it began to get dark, Carlos, their astronomer set up his telescopes and we were able to see Mars, Jupiter and Saturn. The moon was almost full that evening and very bright which made star spotting more difficult but Carlos showed us the various constellations as they appeared. We now knew how to navigate in the northern hemisphere!